Dr Rachel Tolhurst, Senior Lecturer in Social Science and International Health, Faculty of Clinical Sciences and International Public Health. Liverpool School of Tropical Medicine (LSTM). Having grown up in Botswana and Malawi, I have had a lifelong interest in development. I studied English Literature and Chinese Language, and had the opportunity to live and learn Chinese in China before completing my degree. As an undergraduate student, I became increasingly interested in feminist concepts and engaged in a feminist analysis for my final year project. I wanted to further explore this area, and took the opportunity offered by an ESRC-funded MA in Gender and Development, to bring together my development and feminist interests. Through working at the Liverpool School of Tropical Medicine (LSTM), I have had the privilege of being able to immerse myself in research that focuses on gender and equality issues in relation to health. I came to LSTM as a research assistant within the Gender and Health group. I had never worked in Health before, and found myself having to create a new space that embraced both my social science background, and the new health-orientated environment I was in. I am eternally grateful to Korrie de Koning, a fellow social scientist working in health who, at the time, was a lecturer at LSTM. Korrie was instrumental in opening up and encouraging me along a pathway within health that was not already carved out. She introduced me to Guy Barnish and David Molyneux, who led the DFID-funded Malaria Knowledge Research Programme, and persuaded them that they need a social scientist on the team. With their support, I embarked on a part-time PhD jointly funded by two DFID-funded research programmes. Having colleagues like Korrie, who are focused on creating equal opportunities for women to progress with their careers, is key in addressing the loss of women across the career pipeline, and the lower representation of women in senior research and management roles. I was given the opportunity to take on additional duties when I was asked to cover for my colleague Sally Theobald (at that time a lecturer), who was seconded to support an institution in Malawi for 2 years. In 2004 I was supported to enrol on the institutional track tenure programme, a scheme established to help colleagues on fixed-term contracts to transfer to open-ended contracts. Two years later I met my targets and was put on an open-ended contract as a Lecturer. I had my first child straight after this in 2006. I returned to work part-time following my maternity leave, and received good advice relating to how to pro rata my performance indicators on my successful application for promotion to Senior Lecturer. Practical advice like this is key for ensuring part-time colleagues have equal opportunities regarding career progression. For many years, I worked on 3 specified days a week but never felt excluded from meetings or other events. Here at LSTM, it is common for colleagues to travel extensively due to the nature of our research. Therefore the institution is inherently flexible, and staff frequently participate in meetings via skype. Having supportive colleagues is crucial, and I have had the privilege of working alongside some very supportive colleagues in my Department, both female and male. The collaborative atmosphere has enabled a lot of us to progress. In addition to Korrie and Sally, I was also lucky to work on various projects in China with Shenglan Tang, who worked very collaboratively and created opportunities for junior researchers. He was good at linking people up and sharing the credit for research money. He left the institution in 2006, leaving an active 1.5million euro grant which I was asked to manage. Support from senior colleagues who equitably share credit for joint research is critical for the development of any researcher. I currently work 4 days a week, one of which is a full day and the others are school-day hours, enabling me to pick up my children from school. I tend to travel once every 2-3 months, and try to limit my travel time to no more than one week to ensure I achieve a good work-life balance. Up till now I have had a flexible childminder, and have managed to juggle work and childcare without any major issues. However, my childminder is soon to become less flexible, so I will have to face some juggling challenges! It hadn’t occurred to me to apply for promotion before Sally, who was my joint line manager at the time, pointed out that I was performing at the level of a Senior Lecturer. I secured my Senior Lectureship in 2013. In a few years’ time, I plan to apply for a Readership. To achieve this, I need to secure a big grant, as well as publish enough REF-returnable papers. What I have decided is not to do it for the sake of progression. I want to work with people who share the same values as me and take forward research that contributes to social change. If that leads to career progression, so be it. 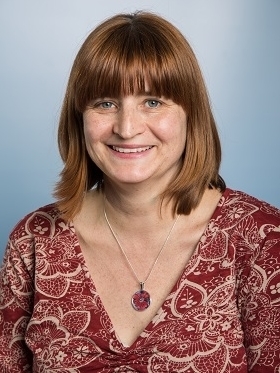 Dr Katerina Finnis was appointed by the University of Hertfordshire in June 2014 as a dedicated Athena SWAN Officer. Based in the Equality Office, her primary role is to support the institution and its academic Schools in their submissions for Athena SWAN awards which recognise good practice in retaining and promoting female staff and students in Science, Technology, Engineering, Mathematics and Medicine (STEMM) in Higher Education. Katerina works with colleagues to ensure that institutional and School action plans are being implemented and played a key role in helping the University and four of its academic schools to achieve Bronze Awards in November 2014. Having worked as a Senior Lecturer in English Language and Linguistics, Katerina has a keen interest in issues relating to gender and the workplace: she is committed to supporting all individuals in attaining a work-life balance and achieving their full potential in the workplace.